Laundry is FUN! Okay, okay, maybe it's not that much fun, but it can be cute. :) Laundry is one of those chores that I don't mind too much. I usually do it twice a week, with my older girls doing towels on Mondays and I do sheets on Monday, also. I'll get things started as soon as I get up in the morning and then bring up the baskets to my room to fold while I watch tv. After watching my little ones trying to balance a big pile of clothes (they'd insist on taking them all at once) while going to their rooms and seeing half the clothes fall on the floor along the way, I decided we needed some baskets to make it easier for them. While growing up, we each had our own color of basket to distinguish whose was whose. I'd never seen colored baskets, or any baskets like we used to have for that matter. So when I stumbled across these plain black and white buckets in Walmart one day, I decided with a little vinyl they would work. I let each child pick their color for their name and went to work. The vinyl worked great, except for Cheyenne's name, for some reason that vinyl didn't stick as well and we have to keep smoothing it down. I think they turned out pretty cute and make me smile as I fold clothes. So what is your best laundry tip or what do you do to make it a little more fun? Share your best ideas with us! I'd love it if you would follow me and like me on Facebook! I love/crave/thrive on being organized. I always have been, just ask my little sister who used to get mad at me when I had to have a "plan" before we played Barbies. Or my daughter who makes fun of my color coordinated closet. But it's just who I am, if I'm not organized, I get a little crazy. When my older sister lived here, I used to go to her house quite often just to help her organize and dig out of her piles or keep her on task. She even asked me to teach a class for her Relief Society (women's church organization) activity. I really had fun with it and was honored she asked me. I thought I'd share some of my ideas from that activity on being organized and what works for me in a series I call "A House of Order". So here's my first in the series, start your organized day by having a plan. I know, not a new concept. Many of you probably have something you use, IPhone or something similar (I think I'm the only one is the world without one), planner, calendar, scrap of paper, but how is it working for you? I find that if I have some sort of idea for the day, I can get a whole lot more done. However, I still haven't found the "perfect" way for me. I don't like electronic things, for one, I don't carry my phone with me so I wouldn't look at it much. I have a family calendar hanging on the fridge, works great when I remember to write things on it. :) I also have a planner/notebook thing and it's okay, but want to try something better. So I've decided on a clipboard with a daily or weekly calendar on it. I've found several all over the internet, and I'm testing out which one I like best. Easy to try it all and if it doesn't work, all the new planners will be out in stores for the next few months. Here are some of my favorites I've found. I really like this one for a couple of reasons - 1. It's cute 2. I love the title "Today's Plan" and in the bubble, it says "Today is going to be a great day!" 3. I really like the water bottles to mark off as you drink your water for the day - great idea! and 4. For $3, Kara will customize it for you. So where she has the homeschool section, something I don't need, I'll have her change it to something applicable to me. Here is another one I really like. This calendar comes in a kit of 4 different calendars for $8 on her etsy shop. So worth it, because they are all undated, so you can use them forever. Or you can buy just the calendar above for $5 and all the blue sections are editable, meaning I can download it to my computer and type in all my to-do things for the week. For a neat freak like me, that is awesome! (I have a problem with things looking nice and neat, I think. Starting in 6th grade, when we got our very first computer, I seriously would take notes in class and then come home and type them all up so they wouldn't have that pencil smear on them (HATE THAT!) or mistakes, or just my sloppyish handwriting from writing so fast. I know, I'm weird.) My favorite part is having my whole week visible at once. And again, the meal plan for the whole week is right there. 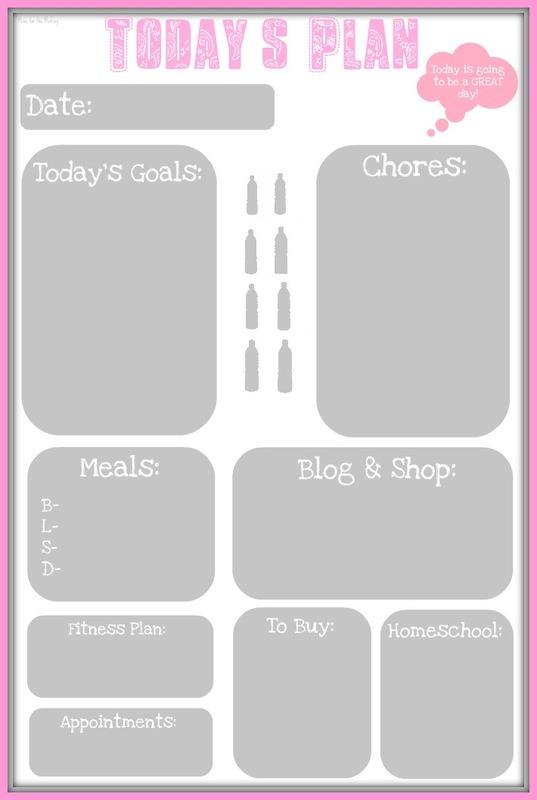 Another great, free one is at http://printables.yourway.net/daily-action-planner/. Sorry, I couldn't get a picture of this one. This one is also editable, type your plans in and print it up, or just use it on your computer. It is a daily calendar, but also has areas for "Calls", "Emails", and "Notes". Really useful. 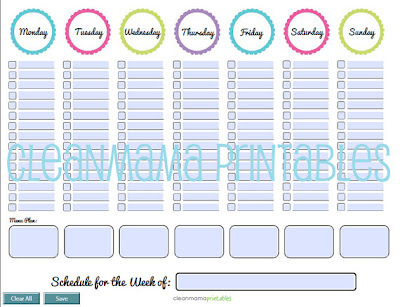 Finally, I really like this free printable from Clean Mama, to use with the other calendars. 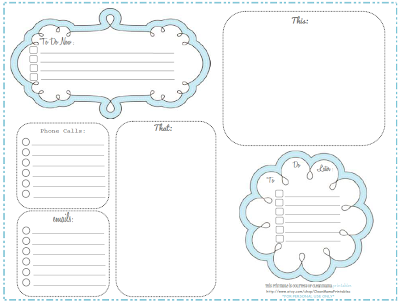 It is a "This and That" printable. 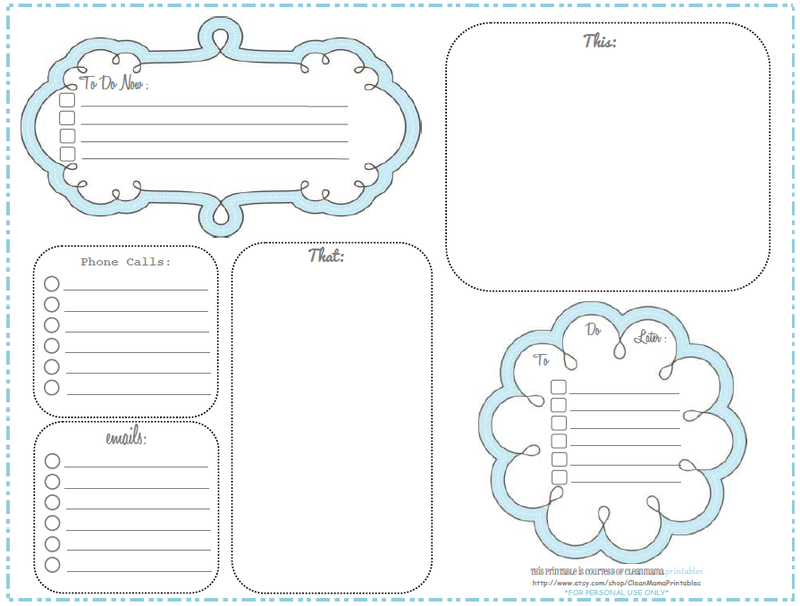 Sections for "phone calls", "emails", "to do now", and "to do later". So right now, I have the "Today's Plan" on my clipboard with the "This and That" list underneath. I love having the different lists right there and on-going. I can keep a running list of what projects I need to tackle around the house and just check them off as I get them done - so satisfying! Then I can organize each day by what I plan to tackle. 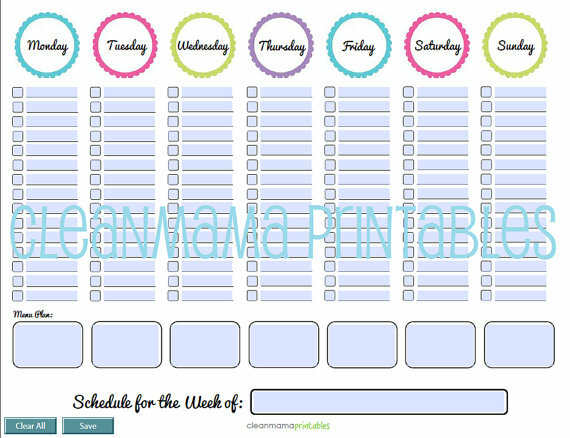 Another great idea from Kara at Mine for the Making, is to slip your calendar in a plastic page protector or laminate so you can use a dry erase marker and use it again and again. I like to take 5 minutes after the kids are in bed and I'm just watching tv or whatever to plan out my next day. Really easy, and makes a world of difference in the next day. So how do you organize your day? Are you all electronic or a list maker or both? What works or doesn't work for you? I'd love it if you follow me and like me on Facebook! This also happen to coincide with use getting a beef this week, so it was perfect timing that I found this great post here. Now, I have an upright freezer, so things don't get lost really, and the different cuts of beef and the chicken are in different spots, so I know when those are low. However, I do forget what meals I've frozen and stuck out there. Or I swear I still had some spaghetti sauce that I was going to use for lasagna, of course, I only go looking at 4 p.m. when I'm getting ready to make the lasagna and find I used it already. So no more, when someone puts a meal in the freezer or takes something out, it WILL be added or erased. For a chest freezer, this could be a lifesaver. No more mystery meat hiding down in the corner that you never find until the next time you defrost your freezer (or someone doesn't close it tight and everything thaws outs. :) )You could also do this with snacks for the kids in the fridge, then they wouldn't have to stand there with the door open forever trying to find something to eat. See my handy marker with the built in eraser and magnet - gotta get you some of those! It erases very easily and if there's any residue left, the original poster said she just wipes it down with rubbing alcohol occasionally. What's the best tip or trick you've found this week? You'd make my day if you Follow me and "Like" me on Facebook! So if you haven't been able to tell, we (Cheyenne, Natalie and I) had a lot of fun redecorating their room. In case you missed it, you can see all we've done here, here, and here. Last post in this series, easiest jewelry organization EVER, and a very cool trash redo. What is the easiest jewelry organization ever you might ask? Well, here it is. A simple hanger. We assessed what they needed, something separate, easy to get necklaces on and off, and something cute. While walking through Walmart, Bam!, I saw these fuzzy covered hangers and thought those would work. We tied a bow (with wire ribbon so it stays stiffer) and we were about done. When we first made these, they didn't have quite as many necklaces and one sister was worried the other would use her hanger, so I made these to put on each. I took a cardstock punch out letter I had in my scrapbook supplies, glued it onto some scrap chipboard (actually packaging from another product) and cut them out together. I covered it all in Mod Podge and sprinkled some glitter on. Decided it need move coverage, so did another couple of coats of Mod Podge and glitter and finished it off with a layer of Mod Podge. Then tied it onto the hangers from the middle hook with some thread. Easiest, cheapest, organization ever! Finally a little trash into treasure redo. As a part of my sister and brother-in-laws' property management business, they clean out and secure foreclosed homes. These homes occasionally still have "stuff" in them that no one bothered to take with them or didn't want anymore or whatever. 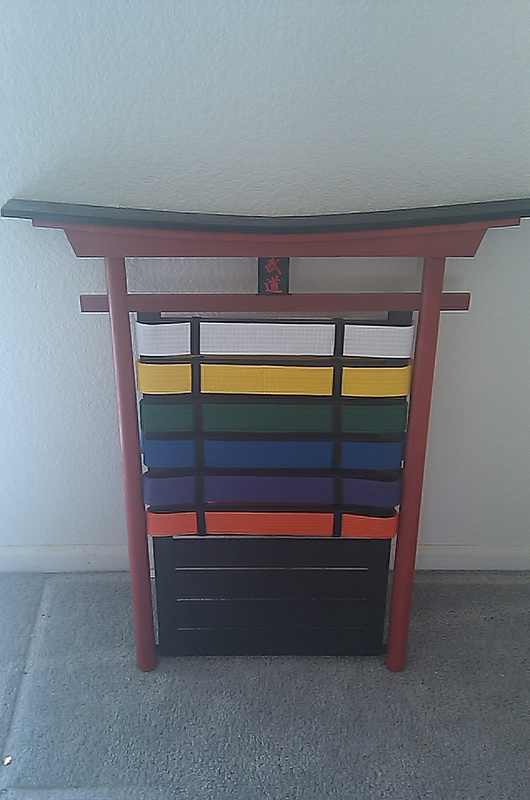 So a few months ago, my sister calls me and asks if I want a display rack for karate belts (they even left the belts!) they found in a house. I told her to send me a picture, so this is a quick "before" picture from her phone. I wasn't too sure, it's kind of ugly - notice the little writing/symbols in the middle. But I told her sure, we'd take a look at it. It really was pretty ugly in real life, too.﻿ But I had just tested my hand at spray painting here and decided to give this a go, too. Out came the high gloss black paint and after a few coats it was looking pretty good. Of course I couldn't just leave it that way, I had to cutesify it so I added some vinyl. Just a little bit, nothing to girly for Natalie. Then I gave it to her for her birthday. She was excited to have a place for all her belts and bonus, Cheyenne agreed it was cool enough to go in their room. She'll add her cool embroidered brown belt to this display when she gets her 2nd degree brown belt in Dec.
Well, that's it. I hope you've enjoyed a little peek inside our home as I showcased our fun projects this summer. Now that the kids are back in school, and we've about got our routines down, it's time to get a little more organized again. So coming soon, some of my best organizing tips and tricks. 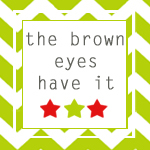 I've been showing you some of the fun we've had in redoing my two oldest daughters' bedroom. Here is the Big Reveal and then I showed you how to make do or do without by repainting and splitting my other two daughters' bunkbeds. Today's post is how to take a plain old boring, cheap, bulletin board and make it a lot more fun. I cut one 12"x12" sheet of paper into 1" strips. Separate them into 2 piles, 6 in each, and staple in the middle. Glue one set of strips into the other set of strips. Now you have one big set together. Now run a strip of glue on the inside of the first strip and bend (not crease) to the inside. Keep going until they're all glued down. This gets a little tricky as some of mine would start popping up. However, I found as I kept going, if I squeezed it down for a second and was careful not to keep touching it afterward, they held. Apparently, this glue needs some drying time to make it permanent, it hasn't come apart yet. So this is how it turned out when I was done. Then you just kind of bend the petals a little, fluff a little, and glue some together where needed. I was still having a hard time getting the two sections to stay together. That's when I realized in the beginning, you don't really need to glue the two sections together. Just glue down each side of petals and then glue the two sections together, it might be a little easier. I finished it off by hot gluing a button (mine had a shaft) in the middle of the two sections. This let me glue the two sections together really well. Then I just glued the flower onto the corner of the bulletin board. Viola! As I said, I was a little leery of how well this would hold together. But after my husband had to drill out the holes in the back (another story) and wasn't really careful with the cuteness on the front, it all held together. Perfect place for my girls to hang up all their handouts and other things from church. As I said, I started out with a 12"x12" paper, and the end result was a 6" flower. So adjust if you want smaller flowers. It's also a good idea to use a double-sided paper, then you get cute on the inside and out. These are so easy to make and really cute. They would be a great accent to top off a present or other things. What could you do with a flower like this? I entered this into the 31 Days of Spray Paint. Crossing my fingers!! I'd love it if you follow me! Like I said the other day, I'm going to be featuring some of the projects I did in redecorating my oldest girls' room this week. Here was the big reveal. I convinced them that I could fill in the teeth marks and we could paint them shiny black. Agreed! Then the second hurdle was when I told them that if they took those beds, they had to use the quilts on Chloe and Maddie's beds, too. They were only like 6 mo. old, Potter Barn (from DownEast Home) and weren't cheap. That was a little more of a challenge, Natalie was extremely adamant on NO PINK! I told them they could both use the lime green side and only the stitching was pink, not that noticeable. Finally, finally, she agreed. Cheyenne's biggest want/request for her room was turquoise, turquoise, and turquoise! She very badly wanted turquoise walls. I tried to get her go a lighter shade, but no, that was not turquoise. Natalie didn't want turquoise walls, I didn't really want that dark of walls either. So again, more smooth talking by me, showing them pictures on the internet, etc., they finally agreed on a cool gray neutral color. My awesome mom came and helped, and Cheyenne and Natalie helped, too, and in a day we covered up the beautiful sunflowers, and their room looked . . . like a prison cell - in Bill's words. :) I assured all of them when we were done it would be awesome! Then after several days, okay, a week or so, the beds were finally done. Now that was a job! We had to fill in all the holes from the ladder and railings and especially the teeth marks and put plugs in and fill where the two beds joined together. Of course we sanded and washed everything down, too. Then I started spraying. I decided to try spray painting as everyone online said it's so easy. It was fairly easy, but here's a few pointers I discovered. 2. It was much easier to spray things when they were standing up than laying down. Both sets of headboards and footboards, I laid down on a sheet in the garage and sprayed. After waiting the allotted time on the instructions and sometimes even overnight, I flipped them over, sprayed the other sides, and when I pulled it up, a good chunk of paint came off on the plastic. I was so mad!!! That meant sanding, wiping down, redoing it in several places. Just don't look to closely because I got tired and some spots still show. :) However, when I sprayed the long, bottom-of-the-bed railing part, I stood it up against the wall. I did have a little running if I wasn't careful, but that was easy enough to sand off. I still had it stick to the plastic a little, but it was a very small edge, very easily fixed. 3. Don't paint in the garage, or outside, when the cotton trees are shedding their cotton (yah, all summer.) There was no way to keep that stuff out of the dang paint. 4. Not only did it take more paint, but it took more time than I anticipated. So make sure you really read the instructions (before you start) and plan ahead. 5. I should have put a varnish or something on top. I didn't think these big girls would be too rough on beds, and I was sick of painting and wanted this project done, so I didn't use anything. They've already dinged them in a couple of places. As we were trying to keep costs down and making do, I also painted a mirror that the girls had inherited from a cousin. It had no hanging mechanism on the back, so we never got around to hanging it before. Now spruced up with some black paint and using the velcro Command strips (AWESOME!) it's a great addition. As I mentioned in the first post, these curtains were not quite floor length, but just didn't work with Cheyenne's bed in the way. Since they were still the perfect colors, I just cut off about 3 or 4' off of them and rehemmed them. Cheyenne is still trying to come up with some fabulous idea for the extra material - pillows or even a skirt or something. So as Nate Burkus always says on his show, when you want a change, shop your house. See what you can use from another room or in a different way. It made our redo a WHOLE lot cheaper, and Bill a whole lot happier. I'm entered in the 31 Days of Spray Paint. Crossing my fingers!! When we built our home 10 years ago, Cheyenne and Natalie were just 6 and 3. It took some convincing, but Bill finally agreed to let me "decorate" the girls room (he really liked the basic builders-white walls.) So with the help of my great sister, sister-in-law, and mom, we stamped all around the room a cute sunflower, yellow and purple border. They had yellow and purple comforters, too, on their bunkbeds. It was such a cute room! So when they were about 12 and 9, they started deciding maybe the sunflowers weren't so cute anymore so we slowly started updating their room a little here and a little there. They decided they didn't like sharing a queen size bed and needed their own. Had to buy a new cheapo bookshelf, because Bill DID NOT want the nice bookshelf painted. Natalie's bed. I shortened the curtains from the old room so they were window length instead of almost floor length. Probably need to repaint the dresser (from Chloe and Maddie's room) since it's cream and the rest of the trim and stuff is white. Also need updated knobs, but that's a job for later. View from the other end of the room. So that's it. The girls LOVE it, and it took a lot of work to get them to both agree on colors and everything. Cheyenne wishes it were a little more turquoise, but at least I convinced her of no turquoise walls. I'll have several more posts detailing what I actually did to make this all happen, so stay tuned. See more of the room Here, Here, and Here. It's that time of year, the first sign of fall, it's FOOTBALL SEASON! Cheyenne has been to every high school game rallying her boy friends to go with her since her girl friends have not interest in football; she's planning her "Colts" shrine in her corner of the room and is wearing her "Colts" shirt today; Jon and Billy are both playing this year which means 4 games for us to watch every Monday or Tuesday, and NFL opening game was last night. Needless to say we like football at our house. So last night we had a celebratory dinner in honor of opening night. Terrible lighting and not great display, but my family barely let me do this before they gobbled it all up. We little smokies wrapped in crescent rolls, a fantastic salad, and peanut butter rice krispie treats in football shapes, oh and Pepsi (my family out rules me.) Great food to sit and eat in front of the tv. I'll share my delicious recipes, every one of them from my great sisters-in-law I just realized. My gourmet chef of a sister-in-law, Geri, introduced me to these fun little snacks. Just pop open a can of crescent rolls, and join two of the triangles together, making one big rectangle. I use a pizza roller and cut the rectangle into 4 strips and then cut those strips in half making 8 pieces. Then just roll a little smokie up in each strip. Bake until brown, just like you would crescent rolls. 4-6 avocados Cut in half-score in shell and use spoon to scoop out. Mix noodles, rinsed black beans and corn. Stir good and set aside. Make Buttermilk Ranch package, mayo and buttermilk. Whip until smooth. Add Verde sauce, lime juice, onions and cilantro. Add dressing mixture to noodles. Stir good and add cut up avocado and add to salad. Add cherry tomatoes (optional). Stir really good. Best if sits in fridge for 1 hour before serving. Heat in saucepan over medium heat until smooth. Stir in 1 tsp. vanilla. Add 5 1/2 c. of rice krispies. Press into 9x13 pan (I use a jelly roll pan so they're a little thinner.) Melt 1 c. chocolate chips or 6 oz. choc chips and 6 oz. butterscotch chips until smooth and spread over top. Chill. Since I didn't have a football shaped cookie cutter, I improvised and squished the sides of a round cutter into a football shape. Worked great! Then put some white frosting in a ziplock bag, cut a tiny tip off a corner and piped on the laces on top. Okay, these are kind of looking like leaves now, instead of footballs. And as I'm typing this Keney Chesney is singing Boys of Fall (awesome video!) on the Today Show, how fitting. So here's to a great season all around! Come on Bobcats, we need win! Good luck Peyton Manning on your surgery, heal quickly (sadly he's going to break his streak of never missing a game, EVER, since he started playing in high school or before.) Good luck Broncos, Billy's team and good luck Jets, Jon's team. Bring on the football. #24-Marissa said . . . "Following them on twitter now!" Yeah, Marissa!! I'll email you and let you know what you need to do to claim your prize. Remember even if you didn't win, you can still get a great deal on this fun software. Go to MyMemories and use this code STMMMS28745 to get $10 off. This was so much fun, I'm going to have to do giveaways more often. :) Okay, on to today's post. What does your front door or entry way say about you? Mine was screaming "this lady is decorating early for Halloween, complete with spooky spider webs." Or, "here lives a lover of nature, too kindhearted and in touch with her environment to kill any living thing." Both of these are far from true, so I was ashamed that's what my house was saying to anyone visiting. I'll admit, it's not something I worry about a whole lot, I guess because I very rarely use the front door. However, I had occasion twice this past week to go in and out of my front door. I was horrified at the condition it was in. My front porch is a nice sheltering place with a little corner that often has some spiderwebs in it. It's a fact of life and I've learn to deal with a few webs, as long as I never actually see the little creepy crawlers (I HATE spiders!) I knew it was time to brush down the webs and wash off the house again, but hadn't gotten around to it yet. However, something had happened since I'd stepped out the last time, the corner, light fixtures, awning, everything was completely filled with spiderwebs and worse, filled with little gnats since we'd had the front lights on several nights lately. Add to that, we have an amazing killer cat who is the best mouser ever! He brings his kills and often deposits them in the corner, sometimes still alive so he can play with them for a while. There is always blood there and this time, several bird feathers. Needless to say, the front porch was gross! So as part of my labor day weekend "fun", I went to work on the front porch. Cheyenne was so kind (and brave) to take the broom before me while I was spraying off the house. She even had her first experience with a great big catface spider (ewwww!) Thank you, thank you, Cheyenne! It took a good couple of hours, but my front porch looks so much better. Now I think my entry way is saying, "here lives a clean, organized family, but still kind of boring." This is were I need your help. I want to hang a wreath or something, but I'm a little leery of it scratching my door. The other thing is it's a metal door and we have siding, so how do you hang a wreath.? I think Bill would object to an over-the-door hanger because the door wouldn't close tight. I have a cute bench made of barn wood and an old milk can next to the door, but it could have some more personality, too. Oh, and there's the cat house, what do you do with that? Give me your best ideas and suggestions because I want my house to say, "a fun, friendly family lives here." 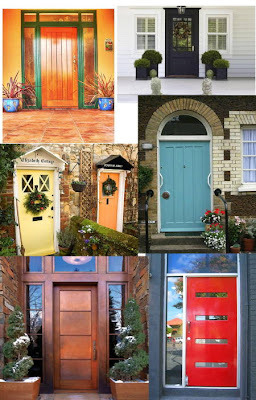 What does your front door say about you? P.S. Does anyone have any ideas for getting blood off of cement? Seriously, I have scrubbed and scrubbed, used cleaners, hydrogen peroxide and nothing will get the blood out of the cement in the "kill corner." Don't forget to enter! Digital scrapbooking software giveaway is still open here. It's that time of year, we've got zucchini and squash coming out our ears. My family is starting to regret asking the question, "What's for dinner? 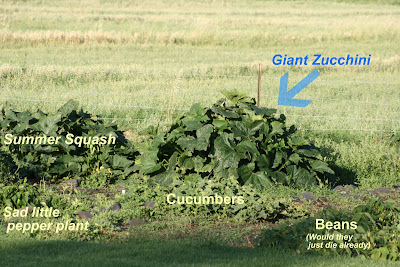 ", because the answer usually involves zucchini in some form or another. However, in my attempt to change things up a little from the sauted zucchini or zucchini bread, I always try a few new recipes each year, some are better than others. Here are a couple that have made the cut this year so far. The first one is Lemon Poppy Seed Zucchini Bread. I found this one last year and never got around to trying it. It is SOOOO good! It makes two loaves and I only put the glaze on the first one thinking I'd freeze the other one for later. Well, they didn't last that long (didn't even have time to get a picture of them), so we ate the second loaf without the glaze. Still very good, just not quite as sweet, which Bill liked better anyway. Place eggs, milk, oil, lemon juice, and lemon extract in mixer and mix until blended. Add flour, sugar, pudding mix, baking soda, baking powder, and salt and mix just until moistened. Fold in the zucchini, poppy seeds and lemon zest. Pour batter into 2 prepared bread pans. Bake at 350 for 50-55 minutes or until tooth pick inserted comes out clean. Makes 2 loaves. Remove sausage from casing; cook with onion in 10-inch skillet until sausage loses redness. Remove and drain on paper towel. Saute zucchini in skillet drippings until transparent. Cover; cook 5 minutes or until almost done; reserve.Combine half of Hunt's sauce with rice and sausage mixture in 7 1/2 x 12 x 1 inch baking dish. Add salt; mix well. Arrange slices of zucchini over top. Sprinkle with Mozzarella and Parmesan; spoon remaining Hunt's sauce over all. Bake covered at 350 degrees for 20 minutes. Makes 4 to 6 servings. I doubled everything but the rice, added squash with the zucchini and put it all in a 9x13 pan. Oh, and I used ground sausage instead of links. Pretty easy, pretty quick, my kind of meal.